Every time he goes to the Apeksha Hospital at Maharagama, his son’s voice comes alive. “Dada we can find money.” He knows that the 18-year-old was no more but he stops for a while to listen to that voice echo in the hospital corridors where they walked with ‘hope’, bearing so much of pain and uncertainty, two-years ago. Knowing that nothing could stop him saying his final goodbye soon, the young Humaid, who was diagnosed with osteosarcoma, didn’t let his last hope – bringing the most-wanted an expensive machine, the PET scanner that could help thousands of cancer patients to survive – to fade away. Until the last days of his life, he joined his father to calculate the donations that poured into the accounts at all 635 Bank of Ceylon branches in Sri Lanka to purchase the PET scanner in 2018. Humaid breathed his last on 12 September 2017, some months before the PET scanner was installed at the hospital, where he was finally treated for the aggressive form of cancer which started from normal shoulder pain. Just like cancer couldn’t stop Humaid realising his dream, nothing can still stop his father’s journey to make Humaid’s dream – saving lives from cancer – a reality. Shocked after his only sons painful death and crushed economically and mentally, he continued to raise funds until the account exceeded its targeted Rs. 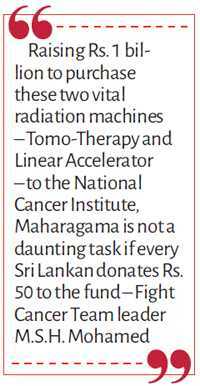 200 million to purchase the Positron Emission Tomography (PET) scanner to the Apeksha Hospital, which is the National Cancer Institute Maharagama (NCIM). Each time M.S.H. Mohamed embarked on a project to help cancer patients, he hears his son’s voice which says “Dada you can do it”. Mohamed, who is willing to embark on impossible tasks to make them possible to save cancer victims on behalf of Humaid, has signed an MoU with the Ministry of Health to purchase two vital machines – Tomo-Therapy and Linear Accelerator – to the NCIM, recently. “This year the Fight Cancer Team (FCT) is to raise a fund of Rs. 1 billion to purchase these two vital machines to the hospital. It is not a daunting task if every Sri Lankan donates Rs. 50 to the fund,” he said at a press conference held recently to launch his project for 2019. “We always believe that nothing is impossible when we have Sri Lankans, with golden hearts that beat for the pain and suffering of cancer patients, who are willing to come forward to help us,” he said. He also said that people couldn’t expect everything to be done by the Government, which was already spending Rs. 20 to 50 million on some cancer patients. “Majority think that the bypass surgeries are the costliest but only a few are aware that cancer treatments and drugs are more costly than any other medical treatments. The Government allocates billions of rupees to the NCIM,” he noted. According to Mohamed, the Rs. 1 billion fundraising project would not be a difficult task if the entire Sri Lankan population of over 21.5 million donates money to the fund. “We all owe to our country. This would be one way of paying gratitude. When we started the PET scanner project, in every 11 minutes, a Sri Lankan living somewhere in the country or abroad put money to the BoC account to purchase the machine to save peoples’ lives from cancer,” Mohamed said. After spending all his savings to save his son’s life, Mohamed said that he felt he was fighting a losing battle in raising the funds for the PET Scanner but his son gave him the energy to walk that extra mile to bring hope for thousands of people who are battling with cancer. “Nothing is impossible when we have the blessings of generous Sri Lankans who are always rallying around worth causes,” he said. “I was there at the NCIM for over three-years with my son. The Tomo-Therapy can be done at a cost of Rs. 1.3 million at private hospitals but the majority of cancer victims have no finances to spend on this treatment,” he said, recalling how his savings got drained on his son’s treatments. The FCT had held over 230 meetings with different officials, including ministers and top government officials, to plan its fundraising projects during the past two years. “We can’t wait for a year to complete raising Rs. 1 billion as in every hour one would die of cancer. We can save many lives if we can bring these two hi-tech radiation machines soon,” Mohamed said. The FCT expects to raise funds to purchase the CyberKnife (CK) machine in 2020. There are eight CK machines in India and Colombo University second-year student Chamodi Adhikari was send to India early this month to undergo CF therapy, which costs Rs. 5 million in India. It costs Rs. 8 million if it is done in Singapore. When Mohamed met Chamodi, he promised her to raise the fund within a week as it was an urgent surgery to save her life. “We collected it within three-days to send her to India,” Mohamed said, recalling how the FCT had also collected Rs. 1.5 million within few days to send Praveen to India for treatment for osteosarcoma cancer, recently. Three months ago, Mohamed had visited the ward where his son was treated, to give some fruits to patients at the ward to mark his son’s death anniversary. The 13-year-old Praveen, son of an estate worker in Rakwana, was lying on the same bed where his son was and had to suffer from the same cancer, Osteosarcoma. Humaid was just turned 15-years when he was diagnosed with Osteosarcoma and could save his life if his leg was amputated from the limb to prevent spreading cancer further. But unfortunately, while attempting to destroy the cancer cells by giving treatment locally and abroad, the monstrous cancer cells began to grow rapidly. Battling for life for over two-years, Humaid died at the age of 18-years. Mohamed raised a fund of Rs. 1.5 million to treat Praveen in India within three-days. “Praveen is my son now. I am happy to see him walking,” Mohamed, who is being referred to as a hero or the God by many cancer patients who have escaped death due to cancer, said. Heath and Indigenous Medicine Minister Dr. Rajitha Senaratne, who was the Chief Guest at the event, commending the support and fundraising done by the FCT led by Mohamed said while other parents continued to grieve over their children who died of cancer, Mohamed had made it a challenge to embark on a journey to help others who suffer and fight against cancer. Minister Senaratne said that the name of the hospital and the treatment given to the patients had now changed with improved facilities to cure cancer. “Earlier, when patients entered into the hospital and saw the name board ‘Cancer Hospital’ they knew that they were in their final journey in life. They were 50% dead mentally and they rely the balance 50% on medical treatment. We have changed the name to give them hope. This is why we called it ‘Hospital for Hope’, he said. “The Government had opened six cancer treatment units including the unit at the Thellippalai Hospital in Jaffna. Earlier, bone marrow transplant was not performed at the NCIM because oncologists didnt have confidence on postoperative care of the patients due to lack of facilities. But with the latest facilities provided to them, they have done 52 bone marrow transplants at the NCIM successfully with no deaths, he revealed. 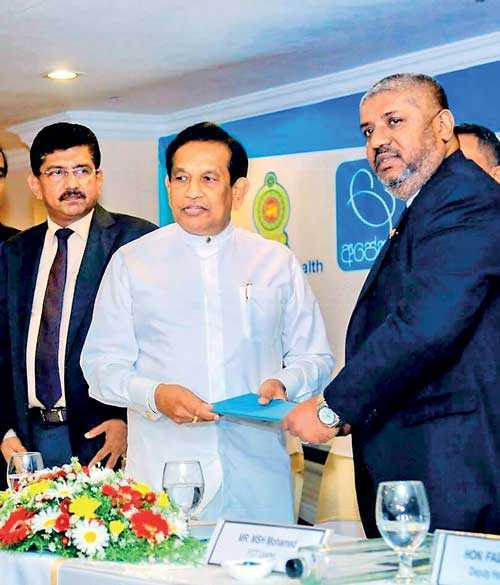 Minister Senaratne said that it was important for people to join hand with the Government to fight against cancer as it was the second commonest killer disease in Sri Lanka, which was increasing at an alarming rate. NCIM Director Dr. Wasantha Dissanayake, who has donated Rs. 1 million that he won from being the winner of the Sirasa Lakshapathi, a quiz program, to the NCIM, said he would give his fullest support to Mohamed and the FCT to raise the fund until the last cent of the Rs. 1 billion was completed. He said that cancer patients reported to the hospital had increased by 20% compared to the numbers five years ago. The commonest cancer among women is breast cancer and it is on the increase due to various reasons including lifestyle changes and improved facilities for early detection. Among men it is oral cancer due to smoking, drinking and betel chewing, Dr. Dissanayake said, explaining the importance of installing the latest hi-tech radiation machine Tomo-Therapy at the NCIM. At present, the NCIM uses the two Linear Accelerators and four aged-old Cobalt machines, which are being phasing out in other countries, for radiation treatments. Dr. Dissanayake requested all Sri Lankans to make donations to the fund to purchase the two radiation machines to the cancer hospital. NCIM Oncologist Dr. Jayakumaran Nadaraja, explaining about the facilities in the hospital, said that the aged-old cobalt machines at the hospital were installed in 1956 and the first Linear Accelerator was installed at the hospital in 2006. He said that the Tomo-Therapy and Liner accelerator machines to be given by the FCT were very vital in cancer treatment. “These treatments available at the private hospital cost nearly Rs. 1 million and it is not affordable for the ordinary patients. In the Tomo-Therapy treatment process, a high dose of radiation will be given to the tumour while minimising radiation exposure of the other areas around the cancer cells,” he said. The next project of the FCT schedule for 2020 is to purchase a CyberKnife machine, which helps to perform curative radio surgeries to the required angle to destroy tumours. Thanking the FCT for providing hi-tech machines to the NCIM, Dr. Nadaraja said the FCT handled projects, including the PET scanner project, is a highly transparent and accountable process by having an account at the hospital to raise funds. “I am confident that kind-hearted and generous people of Sri Lanka, who know the pain of the cancer victims, will give their full support to bring these two machines soon to save many lives,” he said. FCT Marketing Manager Piyush Singh, from which the two machines would be purchased, said that those machines with advanced technology would not only provide palliative care for cancer but would also provide curative treatments for patients to live longer. “The data states that cancer is becoming a big problem with 38,630 new cancer patients are being diagnosed in every day around the world and it is predicted to grow to an estimated 25 million cancer victims by 2030. Globally $ 1.6 billion had spent in 2010 for cancer management,” he said, adding that it is a significant burden for all economies in the world. Singh said that the world needed to find solutions to fight against cancer and every patient deserved the best possible treatment in the world. “The Tomo-Therapy, which works on a plan, caters to the entire spectrum of the disease. This can be used to treat paediatric patients, victims of bone marrow cancer, sarcomas, head, neck and breast cancers, which are increasing, lung cancer etc.,” he explained. According to Singh, the Tomo-Therapy, which causes no side effects and radio-toxicity, helps to prevent recurrent tumours as it can treat them at different locations at once. “I request all Sri Lankans to visit the NCIM, if you have not gone there yet, to feel the plight and the pain of those patients… spare your time, just to talk to them to give them hope… no matter how rich or poor you are but donate few rupees to the fund and most importantly donate fast to save their lives,” Mohamed requested. It is a new technology to do radiation treatment, which combines treatment planning, CT image-guided patient positioning and treatment delivery into one integrated system in the cancer treatment process. It is a non-invasive procedure that destroys and damages cancer cells to stop them from growing, is one the most common treatments for cancer. Similar to getting a Computed Tomography (CT) system, the patient has to lie on a couch that moves continuously through a rotating ring during the treatment process and radiation is delivered from all angles as the ring turns and the couch moves through the gantry. The Tomo-Therapy is an effective radiation treatment as physicians can adjust the size, shape and intensity of the radiation beam to accurately target the size, shape and location of the patient’s tumour. It is also helpful to verify the location of each tumour before treatment, targeting tumours with optimal levels of radiation, minimising the damage to surrounding, healthy areas, reducing the side effects of radiation therapy. This helps the physicians to decide how much radiation the tumour should receive, as well as acceptable radiation levels for surrounding tissue and organs. From there, the technology calculates the appropriate pattern, position and intensity of the radiation to be delivered. Tomo-Therapy is effective as it combines intensity modulated radiation therapy (IMRT) with a spiral delivery pattern, which means that radiation can be delivered from all around you, which helps ensures the treatment is confined to your tumour. If you wish to make a donation, it must be made to the following account.